A couple weeks back, The North Park Theatre and Casbah announced that legendary folk-singer Rodriguez would be performing the theatre's inaugural concert under new ownership. That show is now SOLD OUT, with Gold Circle seats selling out in under 5 minutes. By popular demand, we have added a second show on Thursday, June 5, 2014, with tickets going on sale Friday, March 28, 2014, at 10am. As featured in the 2012 Oscar-winning documentary, Searching For Sugar Man, Rodriguez lived a blue-collar life in Detroit while two record releases, considered unsuccessful stateside, made him a folk hero in anti-Apartheid South Africa. The North Park Theatre offers an unmatched concert experience in San Diego, with a standing room capacity of 1100, unobstructed sightlines, and state-of-the-art sound, lighting, and production. 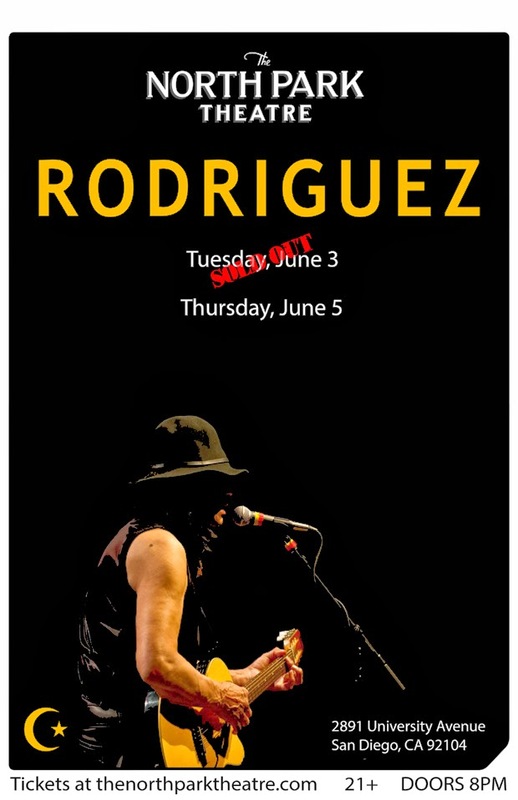 Rodriguez tickets are $40 for general-admission standing. The venue is also offering a very limited amount of $100 Gold Circle Tickets, which include two cocktails, and a front-of-house seat. Tickets will be available at http://www.TheNorthParkTheatre.com or use the direct link here. This is a 21+ show with full bars available throughout the venue. Doors will open at 8pm.